How To Make The Forever Favorite Black Forest Cake? The late 18th century to early 19th century, with the industrial revolution, people also got cakes because all the cake baking dishes and utensils were invented post that revolution. Among many contenders in the world of cakes, Black Forest Cake is like a forever favorite that dates back to 16th century actually. This cake is named after the Black Forest region of Germany. In the German language, it is called Der Schwarzwald and this term Schwarzwald summons oblivion and secrecy rising from the romantic German concept of forest-loneliness. This region is also famous for its cherries and when chocolates were invented, people combined these chocolates and cherries to make a unique cake which ultimately got this name “Black Forest Cake”. Crossing borders of Germany, this cake has now reached every corner of the world. The moist, creamy, and smooth cake dissolves depression, brings friends closer, and starts a new friendship. Read the recipe below and enjoy the cake with your loved ones! How To Make Black Forest Cake? Take flour, baking powder, and cocoa powder together and sift well. In a large bowl, beat the butter and sugar till it reaches a creamy texture. In this creamy mixture, add the eggs one after the other. Make this a frothy mixture and fold in the dry ingredients. Keep beating for a minute or two. To make a black forest cake, you would require two cakes like this. So, repeat this process taking the same amounts again and make the mixtures for another cake. Make these cakes separately in different greased pans. Pre-heat your microwave at 350F for some time and bake the cakes in it for 30-35 minutes. Now, remove the baked cakes from the oven and let it cool on a cooling rack. Now its time to prepare the sugar syrup. For that, you would need the water and sugar. Keep water in a pan and put sugar in it and bring it to boil. Let it thicken and get a one-string consistency. Let it cool. And once the sugar syrup cools down, mix the cherry juice in it. Take 3-4 tsp of cherry jam in a food processor and blend until the jam is slightly crushed and becomes smoother. It’s now time to assemble the cake – the most vital part of black forest cake making. Place the 1st cake on a wide dish or plate and sprinkle the cherry flavor sugar syrup until the cake becomes moist nicely. Now spread one layer of whipped cream on it and top with cherry jam filling. Bring the 2nd cake over this whipped cream and cherry jam layer. Follow the same process as done with the previous cake. Spoon the rest of the whipped cream on the cake top and use a spatula for this purpose. Right at the middle of the cake top, put some cherry jam. Now decorate the cake using a piping bag and make your own designs or write something on the cake. You can now grate some chocolate bars to get chocolate shavings and sprinkle of the cake sides. Additionally, refrigerate the cake for at least 2 hours before serving! 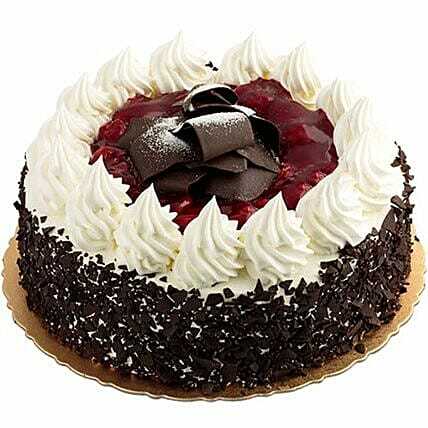 People love to gorge on Black Forest Cake on various occasions like a birthday, anniversary, Christmas, New Year, Valentine’s Day, etc. Therefore, you can either make this cake by yourself or order it online to treat your friends and relatives at your place.